Last week, I was shopping in my local supermarket, when I heard a very loud man. I looked around. I was in the meat department. He was also in the meat department. He apparently worked for the store. The drone continued. 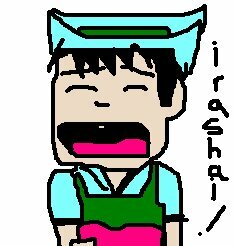 "IIRASHAIIII!...irashaimase! iiiiraSHAI!" He paused to try to think of new inflections for the word, which I thought only meant 'welcome', but apparently that man has thought of a rainbow of meanings for: all the way from " one bite of this meat and you'll think you're in heaven!".. to "Perhaps if I say this loud enough, my boss will notice and give me a raise!" I was trying to find some pork cutlets, but I noticed I was losing my concentration and repeatedly picking over the same package of ground beef with a blank stare. All I could think was... Dear lord that man is loud! Upon the third or fourth time of picking up the ground beef and wondering distractedly if that was what I was looking for, I suddenly noticed I was the only other person in the meat department. I was alone with the meat welcome beckoner. He was working up a crescendo. "IIIIIIIRASHAI irrrashaimase irashaimasE iirashaiMASE irRASAImase IRASHAIMASEeee~!!" By this time I was seriously cross. Who on earth is he WELCOMING? there's no one HERE! and I can't CONCENTRATE! Unfortunately I don't feel confident enough as a foreigner to go up to some guy just doing his job and telling him off. Even kind of timidly. I think while I was standing there staring at him with these thoughts crossing through my head, he noticed me, and suddenly dropping about 80 decibels, started mumbling. That's better, I thought self-righteously, and proceded to find my pork cutlets. I think you could have outyelled him. Goshdarnit...I always forget to leave me name. Viet. Oh! You gave him the infamous Kyra Evil Eye! That can be terrifying! Really, this entry was hilarious, I laughed and laughed. Spring is here, Ahh-sa-pa-riiing is here~!